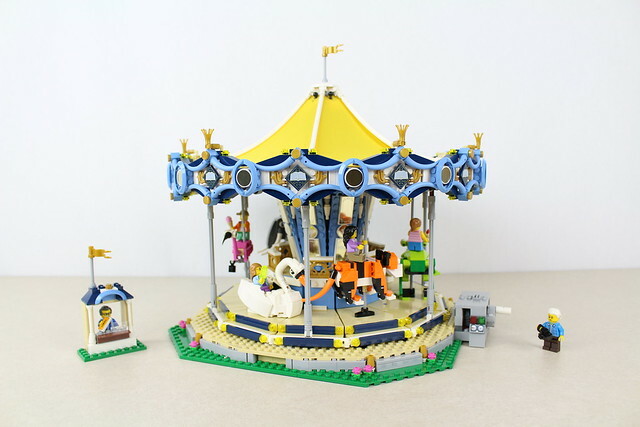 This LEGO Creator Carousel set is one of the most fun sets that I have ever built. The urge to turn the crank to power the carousel ride is irresistible, especially when you know how it all works. 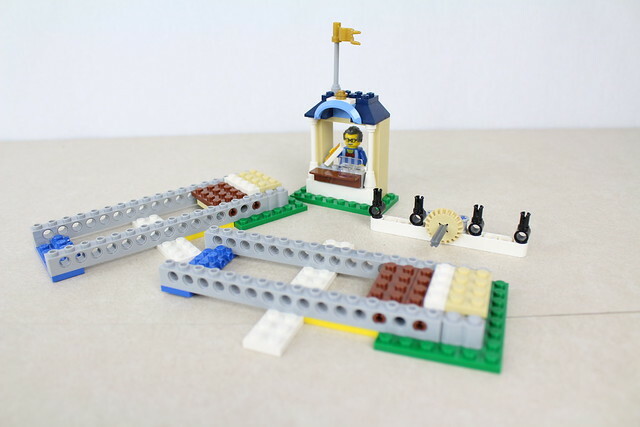 With so many cool pieces to work with that normally wouldn't be found together make this set a unique building experience. Watch the video review and take a look at the detailed photos that go along with our written review for the full analysis. Opening the box is quite satisfying with the 16+ bags that topple out onto the table. 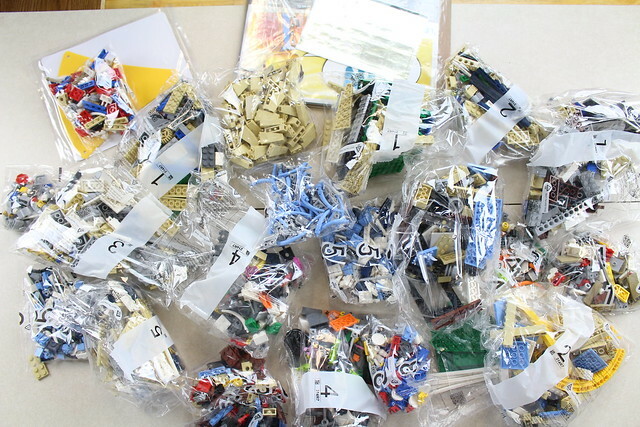 There are 5 groups of bags, and I'm actually a fan of more pieces per bag set because it adds to the building experience because you have to do a little bit of searching before finding the correct piece. 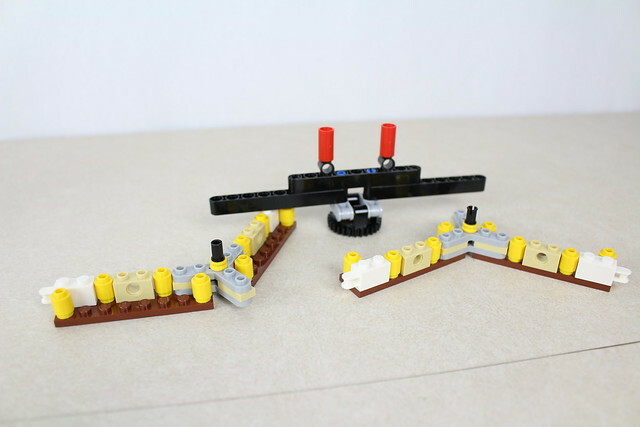 One thing that was odd with our set is that one 2x4 tan plate was not in any of the bags, but it ended up being needed when building the set from bag set 3. One large instruction booklet is included, and I've always liked one rather than several instruction booklets. The reflective, or mirrored, gold stickers add a lot of that imagination-inspiring luster that is sure to stir up memories from one's childhood. 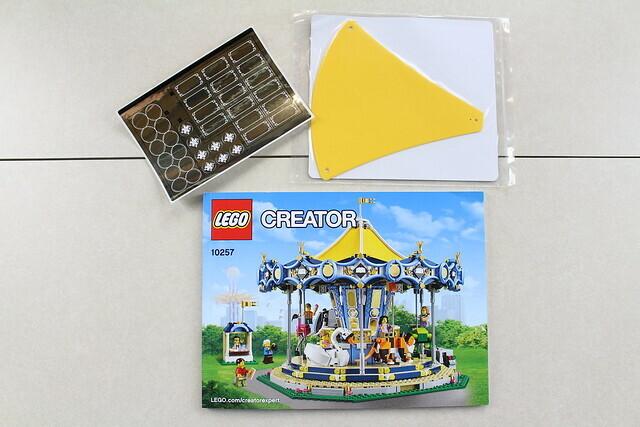 The stickers and the six cloth (not plastic thankfully) pieces are sure to be useful in custom LEGO models made by fans (like us). Although most prefer printed elements, the glossy reflection from the stickers will likely last longer than a chrome piece would, and a printed version would certainly not achieve the same level of shine here. If these were chrome the pieces, they would probably be crazy valuable and crazy expensive. The latter would mean a lot of negative feedback from the consumers no doubt. The less expensive, more durable result from the stickers is probably a better move. Though be careful putting them on, removing them to adjust them will leave visible defects on the stickers. The small ticket stand helps to give a sense of scale to the rest of the model when viewed together. 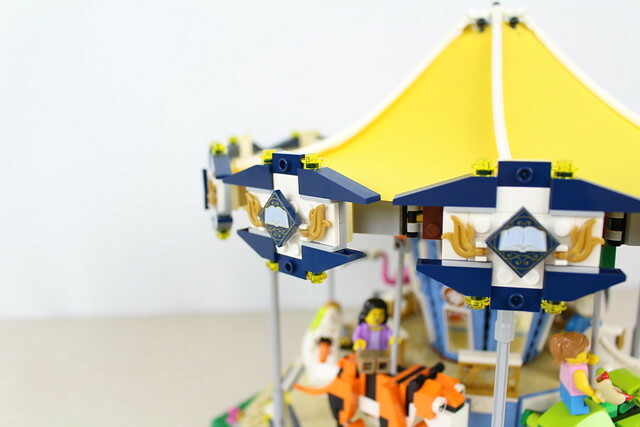 The strong, yet space-efficient support frame for the base of the carousel is built right after the ticket stand. The crucial part of the gear system is built first, which leaves you with a sense of anticipation of how the carousel is going to spin. The gear box is on one side of the set, so a the cross-section of the base of the model is not a mirror-image, which is nice. 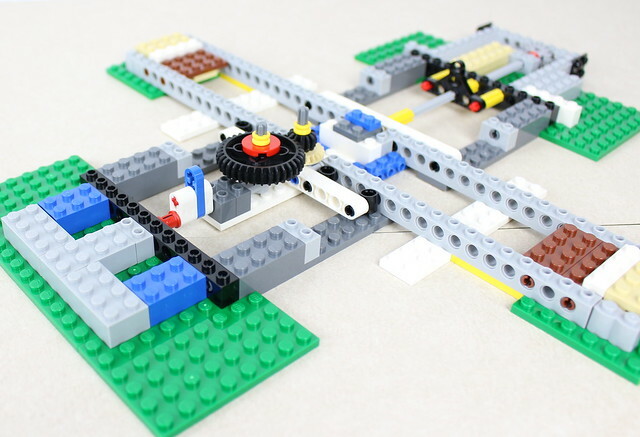 All in all, there are not many gears to make this work, which makes sense given the perceived simplicity of the movement. 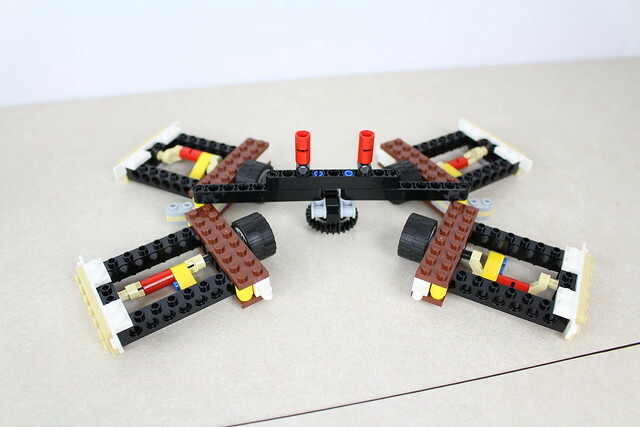 However, there are a lot of pieces that go into supporting the central axle and keeping the gears firmly in place to minimize the stress of the movement due to the mass of the set and also maximize the smoothness of the turning. As mentioned earlier, the base is very strong and space efficient which keeps the model from being too heavy and from damaging itself if carried. 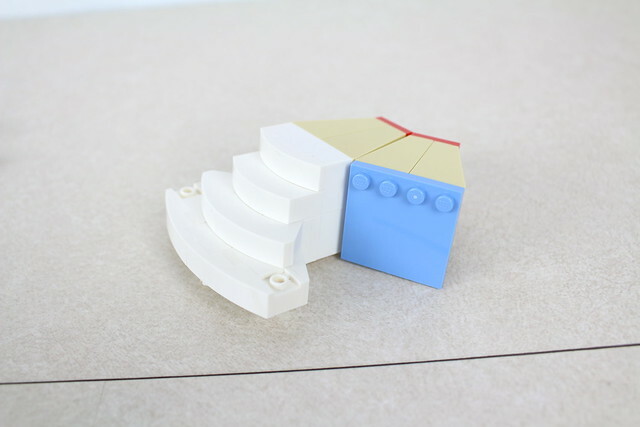 The different and contrasting colors in the base of the model makes it easy to figure out where to place each piece. 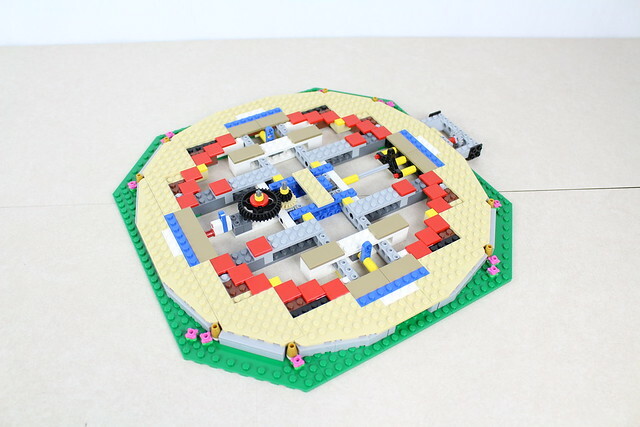 A smooth circular area is created with red and dark tan tiles. Later this will help the platform remain completely flat when being spun. Next, the center column is built. 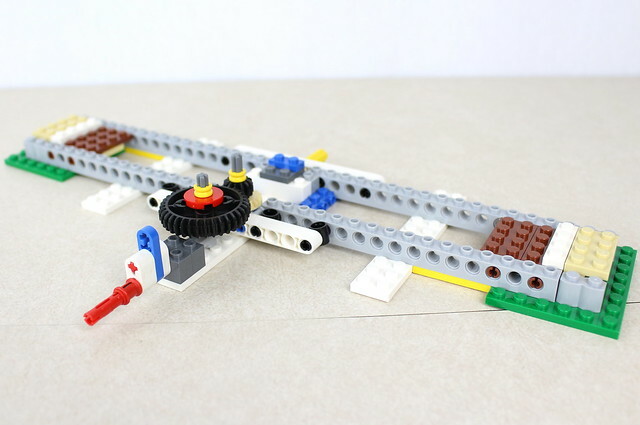 Two different sized gears are connected to ultimately help change the ratio of turning the crank on the side of the model to how much the carousel spins. 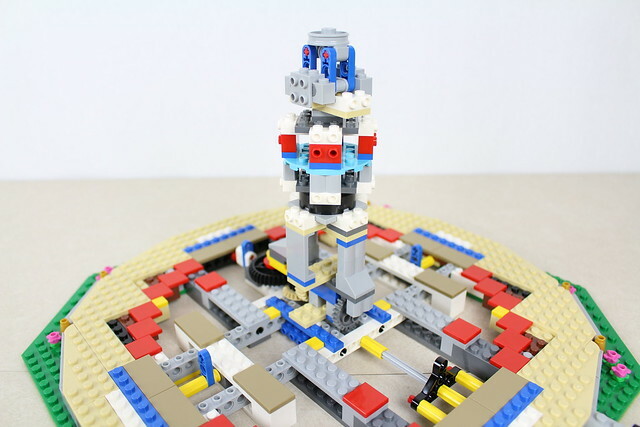 The column is fitted with several pieces with studs on the side to make it strong with plates connected at the 90-degree angle. 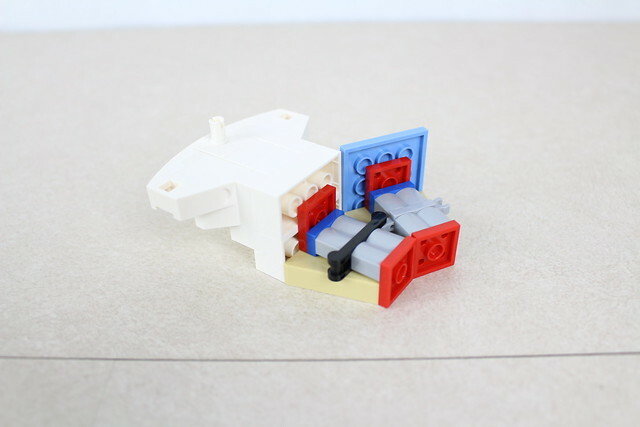 The gearbox includes an easy way to connect a power function set to the model to make it spin on its own. The brown technic piece shown connects to an otherwise unused safety gear that will stop spinning if the too much resistance is met. Say the motor is spinning the axle and someone puts his hand on the carousel to stop it. If that were to happen, a lot of stress would be put on the motor, but the safety gear prevents you from wreaking your motor should such a situation occur. Now with the base of the model done, the platform can be made. Interestingly enough, the top portion of the platform is built first, starting with the rather elegant stairs leading up to it. 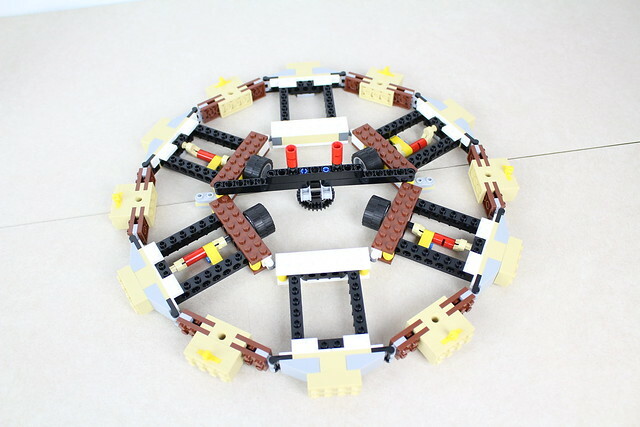 Using a system of clips and hinges, the circular frame is built. 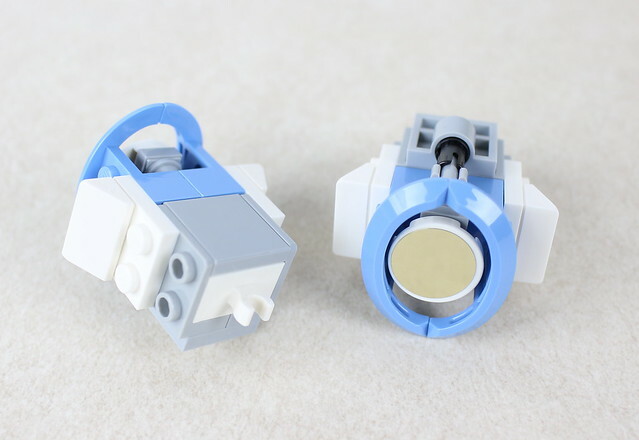 Although not a new piece, the element with the two hinge edges on both sides hasn't come in a set in this quantity, and is definitely a useful element when creating symmetrical hinged components. 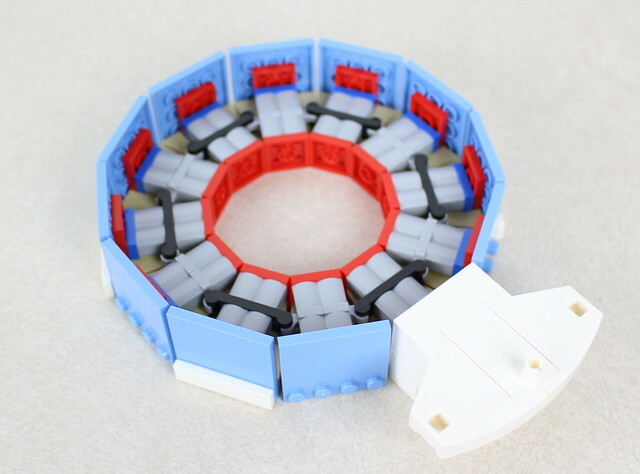 Again, the contrasting colors when building these sections makes the model easier to build, though I would have preferred that blue color instead of the more common red. The light gray log bricks were a welcome sight though! 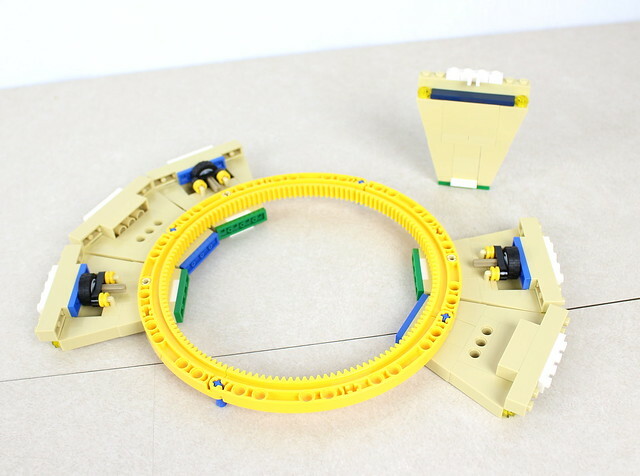 I don't know about you, but I am thrilled to see the four-part yellow gear in this set. 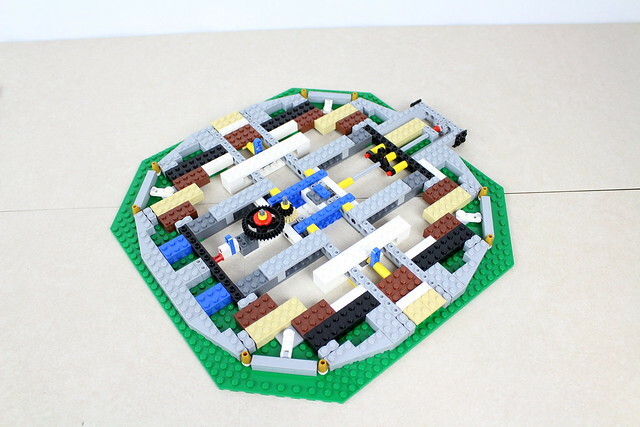 I am sort of a fan of making rounded shapes with random LEGO pieces, and this is certainly a great piece to use to do that. 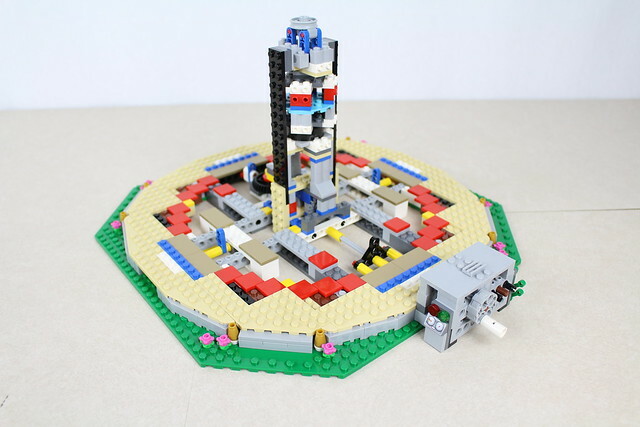 Another favorite piece of mine in this set is the inverted 1x2x3 brick which is used a lot to make the bottom portion of the platform. 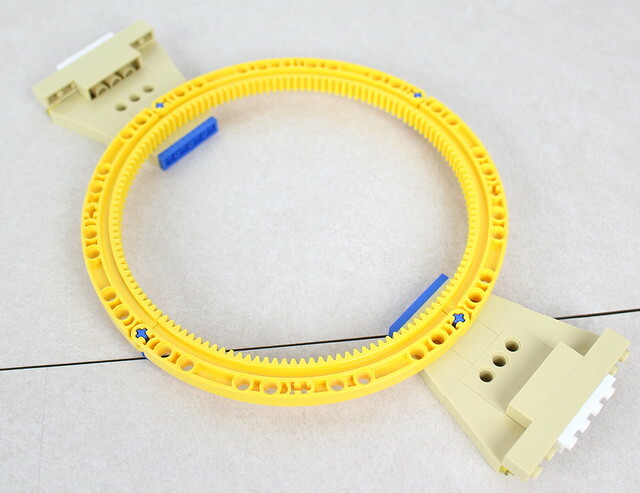 They connect to the yellow gear via technic connections and then are connected to each other along the outside. 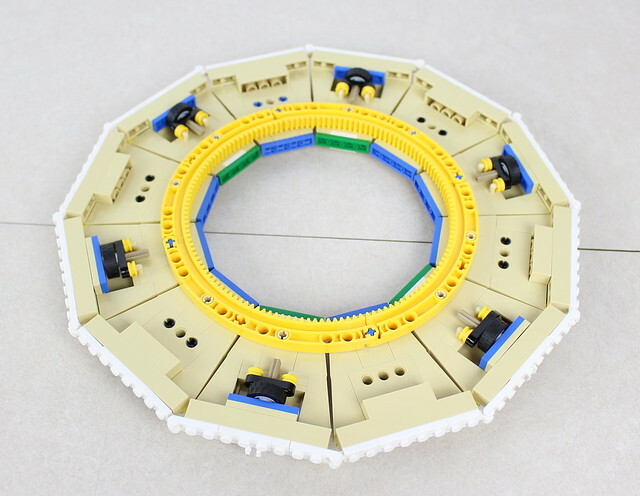 Connecting all of the floor panels together creates a rather cool-looking circle. Because each panel is attached sideways, the surface is very smooth and looks a lot nicer than if tiles were used to make the platform. It's only a matter of sliding the platform over top of the column and it's instantly ready to spin! I was expecting a little adjustment step but was pleasantly surprised that no alignment was needed. 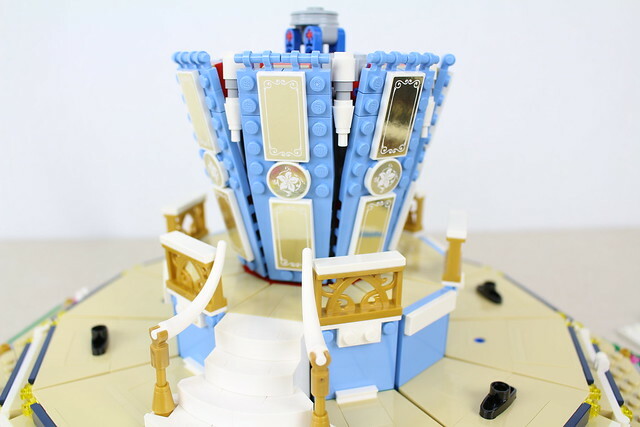 The decorated blue column looks fantastic with the gold mirror stickers, and the blue color will certainly prove useful in other creations. When connecting the side panels to the central column, I could feel just how strong the resulting connections are. This is solid. The most difficult part to connect was the below section that connected to the top of the column. I don't think I've ever had to spend as much time trying to connect something in a set as that initial top layer on top of the column. I eventually connected each part separately and then it worked. 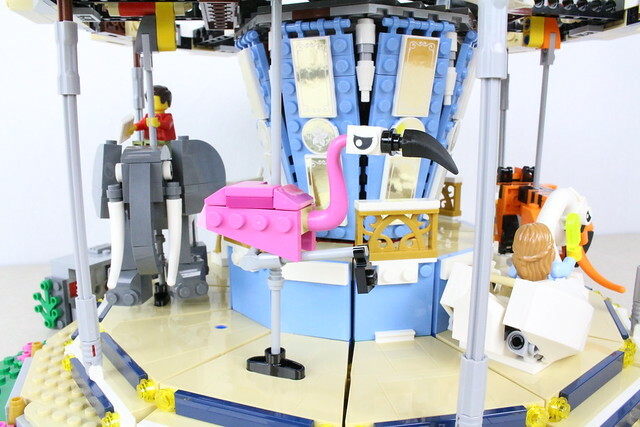 The frame for the top part of the carousel is equally strong and easily holds the weight of itself and the animals that it holds without any sagging. 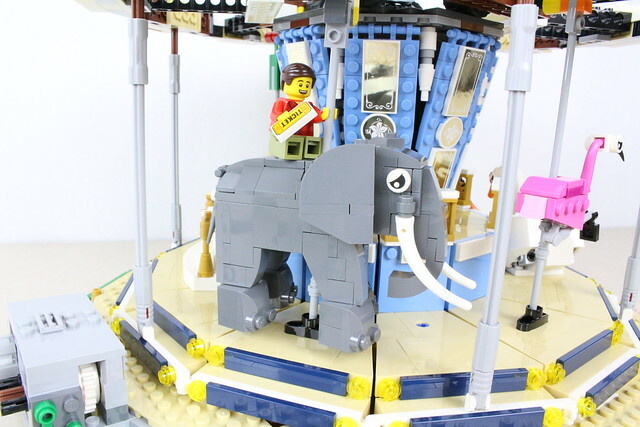 Wheels are used again to roll the top of the carousel along the smooth tiles. A rather neat-looking frame is made for the top portion. 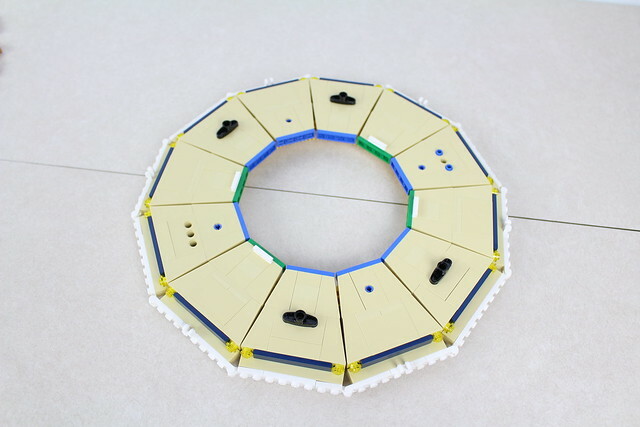 Like the platform below, the frame is held in its perfect circle form with hinges. After a picture showing how to align the frame, the frame is attached to the column. 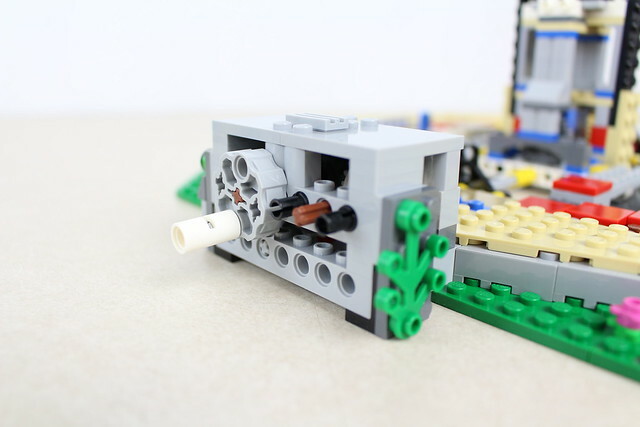 The wheels help support the frame, turn the frame, and are used to make the animals move up and down as the top frame spins. It's quite the elegant design. 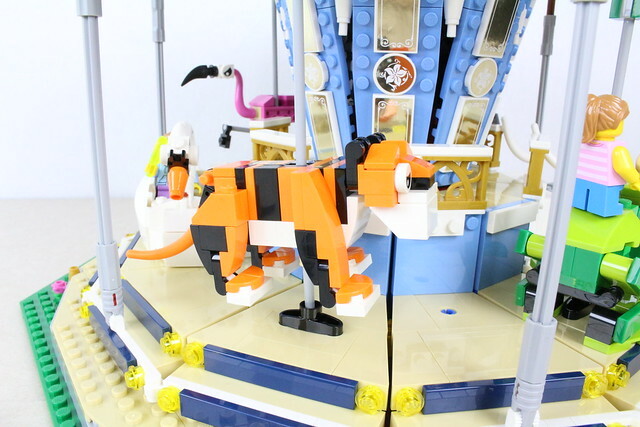 All of the animals are built next. Each animal was fun to build, and it each used very different techniques to achieve the necessary shapes to make them instantly recognizable. 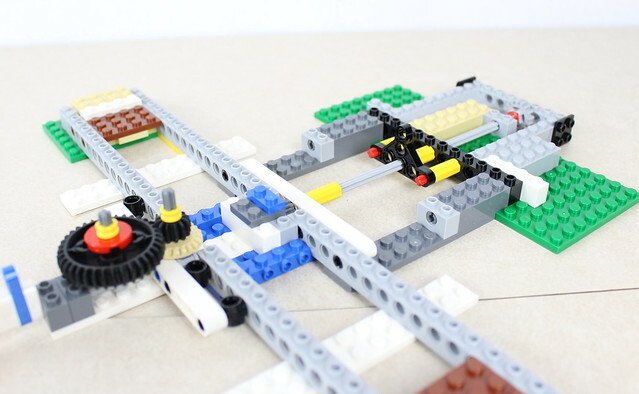 They remind me of the monthly mini sets at LEGO stores, only better. 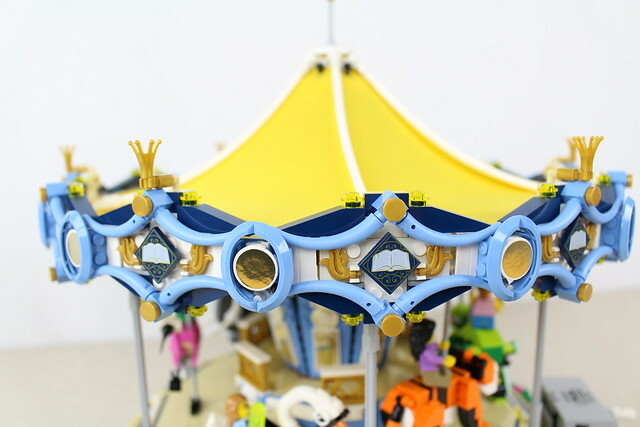 Now that the animals are aligned correctly, the top of the carousel can be finished and the cloth pieces can be attached. 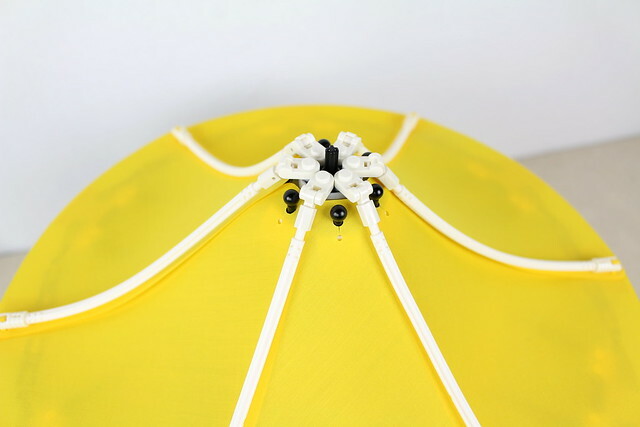 The cloth pieces overlap to prevent gaps, and the flexible white pieces are icing on the cake. 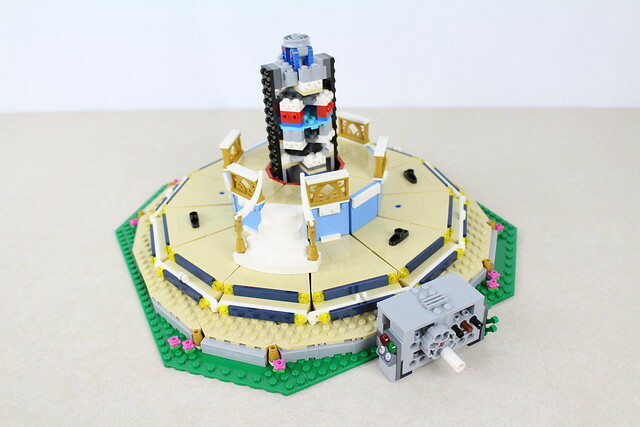 The only felt repetitive part of this build for me was building the final 12 components that fit along the sides of the top of the carousel. However, it was not bothersome at all, considering the loverly colors and careful details. 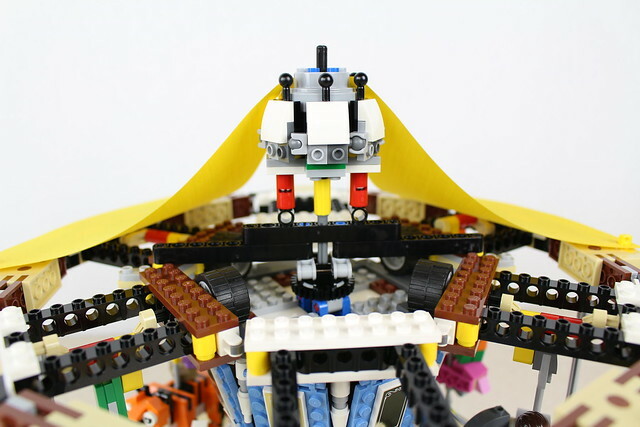 With all of the gaps left by the first part of building the sides, you almost wonder how the perceived seamless curve around the top will be achieved. 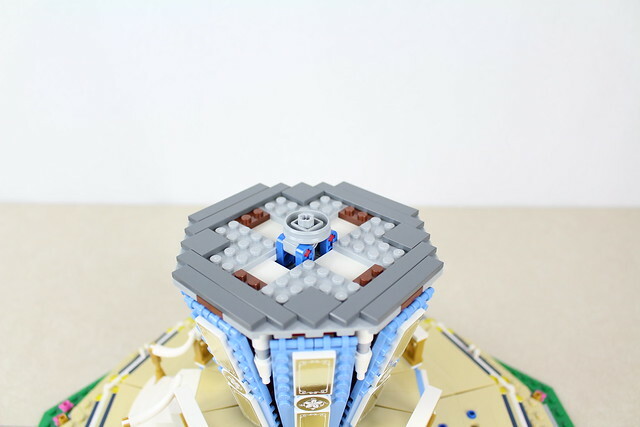 The next portion of the build answers the question how the white is filled in behind the blue details. 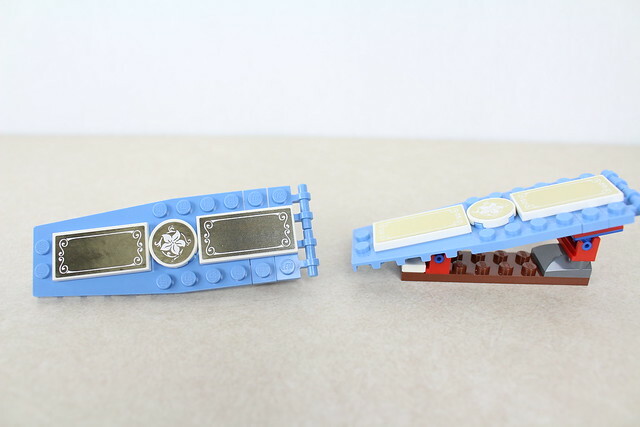 Finally, the tentacle pieces create the perfect finish for the flowing blue detail and then gold crowns and the flag are added to complete the model. There it is! 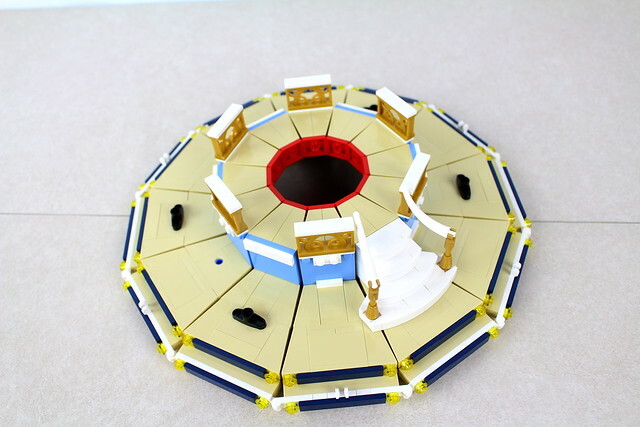 The carousel in all its glory, ready to be played with and displayed proudly. 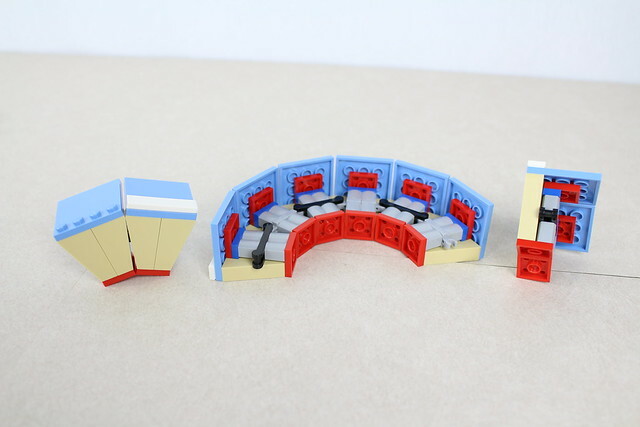 This set is a real joy to build since it's not a traditional kind of structure. It's a ride, not a building. 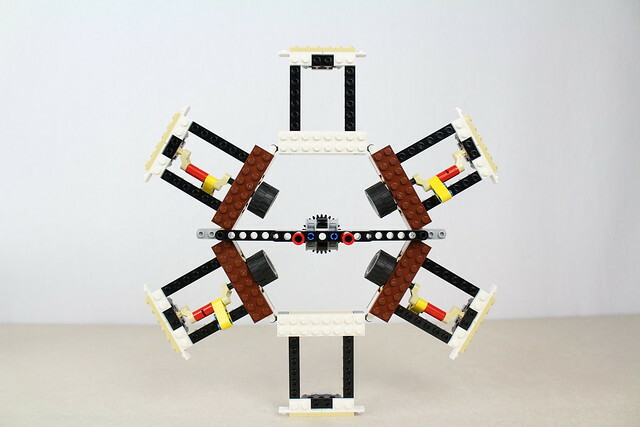 Making a working ride adds a lot to the building experience, and creating circular frames is something that always looks impressive from a LEGO building perspective. 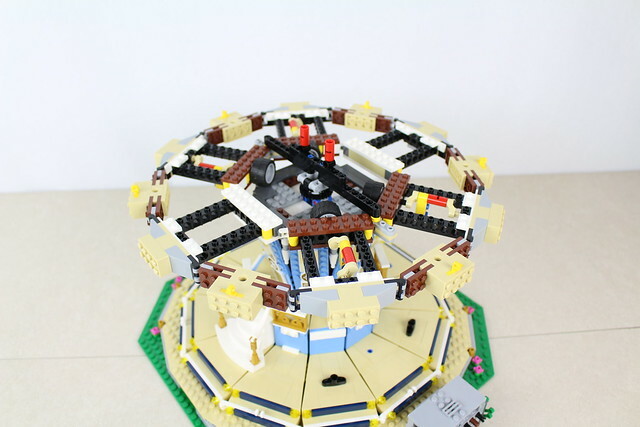 On top of that you get lots of useful pieces for building your own circular creations as you could see from the video and pictures. You not only get those nice blue detail pieces and the gold mirrors, but the special hinge pieces, dark blue slopes, and inverted tan slopes all make for handy pieces for anyone's collection. In case you missed it, here is a link to the video review. 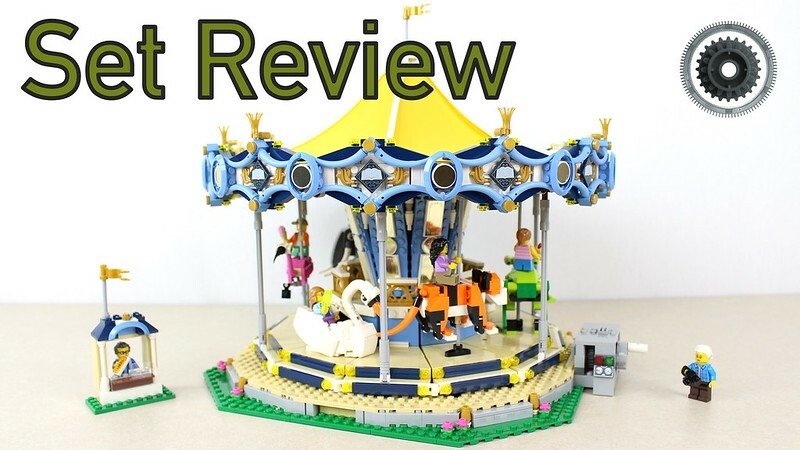 We want to thank the LEGO Group for providing us with this review copy. The thoughts and opinions expressed are our own. If you liked this review, leave us a comment about your favorite part! Till the middle of June we are hosting a giveaway on our Facebook page, so be sure to visit us there as well. Thanks for reading and watching!